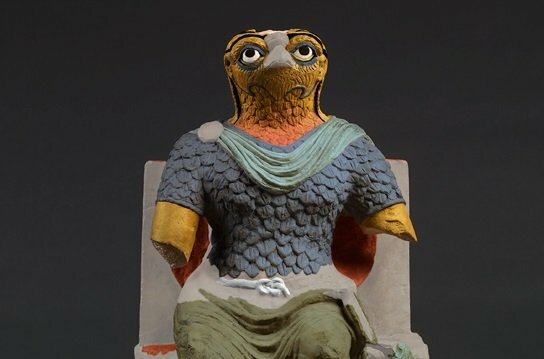 Following our post last week about a cross-cultural statue of Horus, British Museum scientist, Joanne Dyer explains how we know what he once looked like. A colour reconstruction based on pigment analysis suggests how the statue originally may have looked. “You’ve got to see this statue in stone conservation!” said Janet. “It’s a Horus!” she continued excitedly. “And?” I answered, thinking that surely there was nothing unusual about a statue of Horus at the British Museum. “It’s dressed as a Roman emperor!” she smiled knowing that she now had my full attention. The promise of a cross-culturally dressing Horus was irresistible, especially when she added that it also had considerable traces of red, yellow, green and black pigment remains on its surface. One of my main roles as a scientist in the Department of Conservation and Scientific Research, is the study of polychromy; the colours once found on ancient objects and what these materials can tell us about the artistic traditions of the ancient cultures in which they were used. So naturally, I was eager to explore whether the collision of the Egyptian and Roman worlds apparent in this very unique statue of Horus, was also reflected in the materials, in particular the pigments, used to create it. I started by carefully documenting the location of the pigment remains (by taking images using different types of light) and then taking microscopic samples for investigation using Raman and FTIR Spectroscopy. Detailed images of traces of polychromy on the statue. From these studies it was found that the red used was a hematite-containing red earth – or ochre – the yellow, a yellow ochre, and the black used was amorphous carbon. All of these are pigments which are typical of a palette strictly within well-defined Egyptian traditions. The real cross-cultural nature of the piece came upon analysis of the green pigment used on the cloak and sword blade, which revealed the use of green earth (celadonite), a pigment virtually unknown in dynastic Egypt but one of the most common green pigments found in Roman art. The discovery demonstrates that the object was truly blending traditions not only at the iconographical level but also its very fabric. But our Horus held still more secrets. Conspicuous by its absence so far in this investigation was a pigment that is inextricably linked with the Egyptian palette – Egyptian blue, virtually the only blue pigment used in ancient Egypt. Egyptian blue is a calcium copper tetrasilicate (CaCuSi4O10) that has the same composition and structure as the rare natural mineral cuprorivaite, and is one of the earliest-known synthetic pigments. This bright blue inorganic compound was extensively used and highly-prized not only in Egypt, where it was used from the Fourth Dynasty (about 2500 BC), but throughout the Mediterranean until the end of the Roman period in Europe. In addition, this pigment has a very particular property: it is one of a very few materials which luminesce (emit light) in the infrared range when excited by visible light. This emission can be recorded by using a camera with some sensitivity to infrared radiation in the circa 800–1000 nm range. We used such a camera to investigate if any Egyptian blue was present on Horus as often, even when no blue seems to survive, the visible-induced luminescence technique (VIL as it is known) is sensitive enough to detect even single particles of the pigment. And we found considerably more than one particle! Left: Visible-reflected image. Right: Visible-induced luminescence image in the infrared range (800–1000 nm) of the front of Horus. Bright white areas correspond to the presence of Egyptian blue. The pictures above show our results compared with the appearance of the sculpture in visible light. The areas of ‘bright white’ in the monochrome VIL image represent the emission from Egyptian blue while all other materials appear grey or dark. Comparing the images allows the spatial distribution of surviving Egyptian blue pigment to be mapped and it is clear that its presence is very extensive even though hardly anything was discernible with the naked eye. Traces can be seen around the outer rim of the eyes and possibly within the proper left eyeball, as well as in the folds of the cloak worn across the shoulders. Perhaps more dramatically, remnants are also evident on many of the feathers around the lower throat and ears and the feathers or scales which make up the armour. With this last piece of the puzzle in place it was time to ask ourselves the inevitable question: what might our Horus have looked like? Our imaging and analytical results were used as a basis to create computer-enhanced images suggesting how the sculpture might originally have looked. And here he is: meet the Egyptian god Horus in Roman military costume, both Roman and Egyptian even in how he was made. A computer enhanced version of Horus re-coloured to suggest its original appearance. Colour has only been applied to those areas where analysis and imaging provided strong evidence for pigments. Areas which have been restored or where there was no analytical evidence for colour are shown as grey. For more on the technical imaging and analytical examination of this object see Analysis of pigment traces on a limestone sculpture of the Egyptian god Horus in Roman military costume (pdf). The sculpture of Horus will be on display until 10 December 2012, in Room 4.